Advanced Clinical-Grade RTLS provider enhances workflow efficiency, reduces costs and improves patient care. (MOUNTAIN VIEW, Calif. — October 8, 2014) — Based on its recent analysis of the real-time location systems (RTLS) market, Frost & Sullivan recognizes CenTrak with the 2014 North American Frost & Sullivan Award for Product Line Strategy Leadership. CenTrak’s Clinical-Grade Visibility Solutions™ meet the rigorous demands of healthcare facilities by delivering timely and extremely accurate location information with an easy-to-install battery-operated system. CenTrak’s RTLS infrastructure allows for seamless integration with hundreds of healthcare applications. Extraordinary performance along with the company’s consistent track record for exceptional customer support, has earned it the RTLS vendor of choice for leading world-class healthcare facilities in North America, Asia, Europe, and the Middle East. CenTrak’s RTLS platform is “smart” because it combines both Clinical-Grade Locating™ and Wi-Fi location technologies into a single intelligent system. This flexibility allows for easier deployment and helps maximize power efficiency while automating clinical workflow. Its Second-Generation Infrared (Gen2IR™) devices deliver 100% certainty-based accuracy with rapid location updates. It can be used in complex indoor environments – covering entire rooms, beds, bays and hallways. Low Frequency (LF) exciters are used to create choke points and deliver chair- and dispenser-level location accuracy. CenTrak’s unique offering is based on a hybrid of Gen2IR, LF and active-RFID technologies capable of tracking people and assets in real-time. 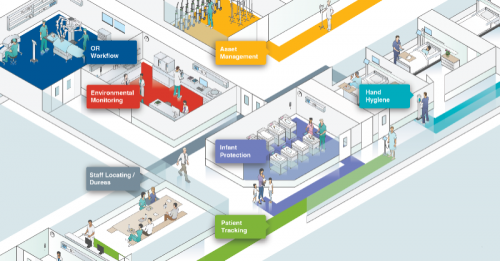 It supports major applications/solutions including hand hygiene compliance monitoring, staff locating, high-acuity workflow, patient and staff safety/security, asset management, as well as temperature and environmental monitoring. CenTrak’s tags can be worn by patients and staff, attached to equipment, or even surgical trays. The entire system is supervised at all times. Location and condition data is collected via CenTrak middleware, which supports integrated partner applications. Automated reporting and status updates are made available to end users through these applications. This provides the user a discernible platform for workflow optimization, improved resource utilization and capacity management. CenTrak’s pioneered technology utilizes predominantly battery-powered infrastructure devices, enabling an easy and economical installation that is non-disruptive to patient care. It features battery life of up to 10 years which ensures low maintenance for the systems and greater portability. CenTrak recently released the industry’s first single-use patient tag with Clinical-Grade Locating capabilities — an innovation expected to accelerate healthcare’s adoption of patient tracking technologies. Each year, Frost & Sullivan presents this award to the company that has developed a comprehensive product line that caters to the breadth of the market it serves. The award recognizes the extent to which the product line meets customer demands, the overall impact it has in terms of customer value, as well as increased market share.